Since last Thanksgiving, I’ve really made an effort not to have a ton of complex recipes being made for a party or holiday. When I first started cooking and inviting people over to eat my food, I would sometimes spend 12+ hours in the kitchen preparing. I get tired just thinking about it. I also wonder how I ever managed to have so much free time to do that while I currently feel like I have absolutely none! Luckily, over the years, but mainly after last Thanksgiving when prep didn’t take me an entire day, I learned to scale back on the intricate recipes and increase the easier to make ones. This popcorn mix is definitely easy to make and you can even make it up the night before to save yourself a little more time. Popcorn and mini pretzels are mixed with peanuts, Reese’s Pieces, and candy corn then topped with a peanut butter sauce. 1. Microwave the popcorn and remove any unpopped kernels. 2. 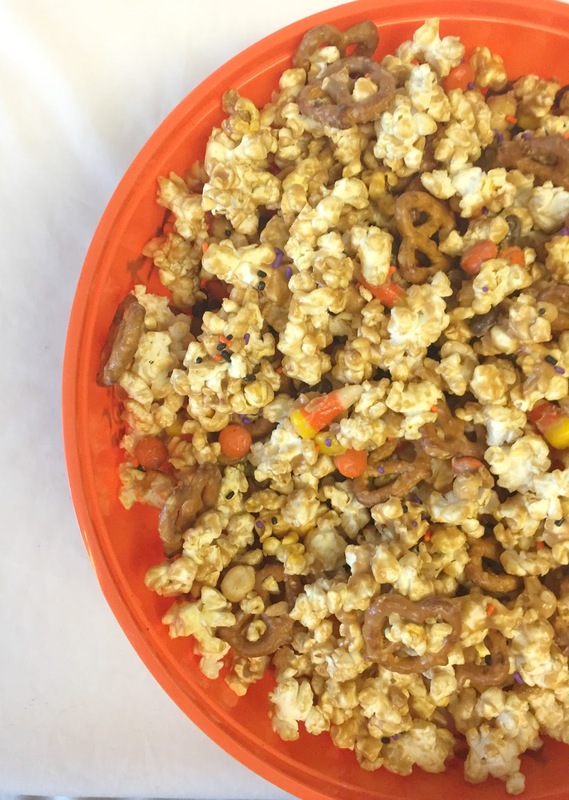 In a large bowl, combine the popcorn, pretzels, peanuts and candy corn. 3. Scoop peanut butter into a microwave safe bowl and microwave in 30 second intervals until it is the consistency to be poured. 4. Add butter, honey and sugar to a small saucepan over medium heat. Cook, whisking frequently until it bubbles up. Whisk constantly and cook for 1 minute more. 5. Remove the saucepan from the heat. While whisking, slowly pour the peanut butter into the saucepan. 6. 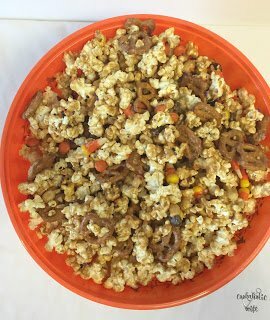 Pour the peanut butter mixture over the popcorn bowl and stir until combined. Spread out onto two large baking sheets lined with wax or parchment paper. 7. 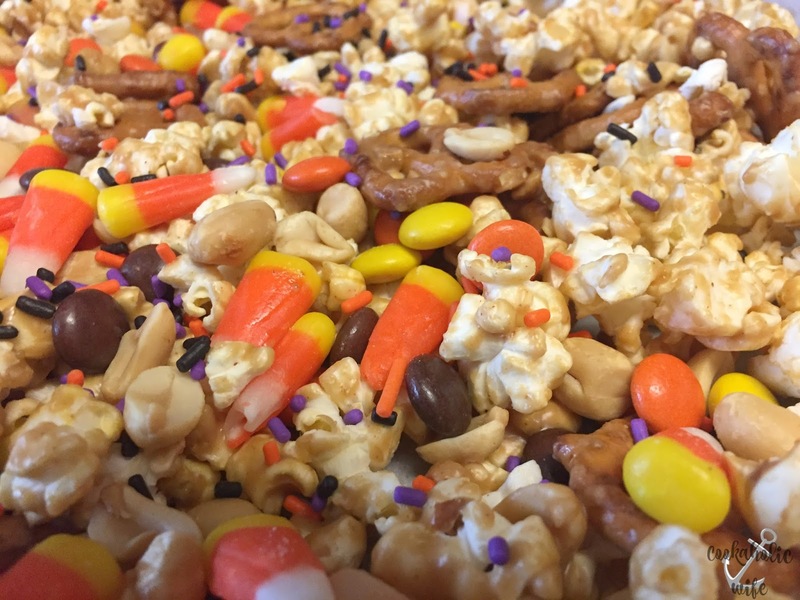 Sprinkle immediately with Reeses’s pieces and sprinkles. Allow to set, then break into pieces. I was a little nervous to try out this recipe because many of the comments said that it didn’t work. The original recipe calls for melting the peanut butter into the butter/honey/sugar mixture until it turns into a caramel consistency, but that doesn’t work. The peanut butter burns before that can ever happen. I decided to go ahead with the recipe but change up how the sauce was prepared. I’ve worked with melted peanut butter before I knew that would be a much easier route to go than trying to cook it in a saucepan. I think this turned out pretty well. If you want really peanut buttery flavored mix, you could double the sauce recipe as this provides just a light coating.